Carmelo Anthony combined with Kyrie Irving to carry the U.S. men’s basketball team past Australia 98-88 on Wednesday. RIO DE JANEIRO — The blowouts are over. The Olympics are under way. “This is the real world now, and that’s good for us,” coach Mike Krzyzewski said. Finally tested, Carmelo Anthony and Kyrie Irving had the answers. Anthony scored 31 points on the night he became the U.S. men’s Olympic career scoring leader, combining with Irving for all the Americans’ baskets in the fourth quarter of a 98-88 victory over Australia on Wednesday night. Irving — born in Australia — added 19 points, including a three-pointer with 1:35 left after Australia had closed within four. A team that won its first two games by a combined 101 points could never get a comfortable lead — and for a while couldn’t get one at all. The Australians, with big bodies inside, quality point guards to counter the American pressure and a wealth of NBA championship experience, stood toe to toe with the team that had blown them out of the past two Olympics in the quarterfinals. But Anthony, the first male to play in four Olympics, steadied the Americans in the first competitive game most of this new team had ever experienced. The Americans, who had barely broken a sweat in Brazil, trailed early in the fourth quarter before Anthony hit a flurry of three-pointers to put the Americans on top. Patty Mills, the tournament scoring leader, had 30 points for Australia. 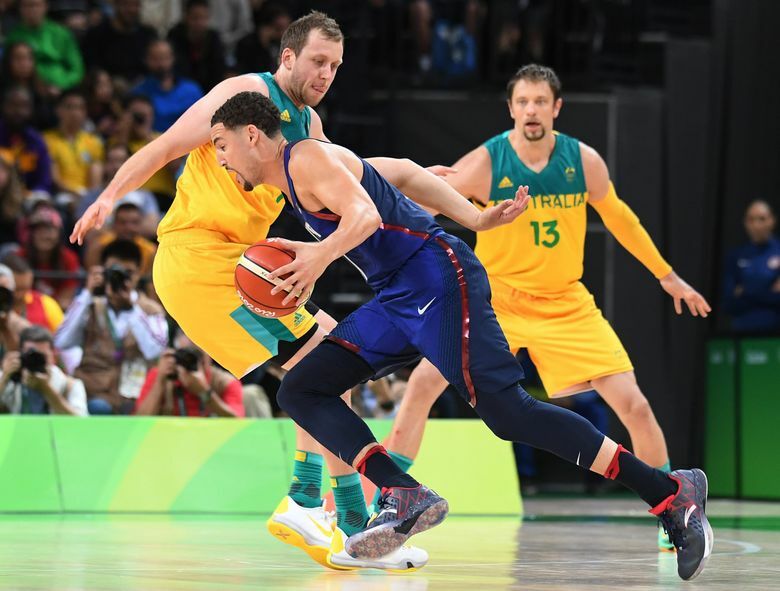 Former Cougar Aron Baynes scored four points for the Australians, while former Cougar Klay Thompson scored six points for the Americans. After five easy exhibitions preceding routs of China and Venezuela to open the tournament, the Americans trailed 72-70 with about nine minutes left. Anthony scored to tie it, hit a three-pointer to give the Americans the lead for good, and then hit a couple more threes that pushed it to 83-76. The team staying on a luxury cruise ship could never relax until scoring the final five points in the last 27 seconds on free throws, with Irving hitting the first three. Andrew Bogut finished with 15 points for the Australians, who have never won a medal but four of their players own NBA rings. They nearly became the first team to knock off the Americans in the Olympics since Krzyzewski took over in 2005. “We have a pretty gritty group that’s pretty tough and we battled all night,” Bogut said.